I was lucky enough to visit one of the markets with my (now this is complicated) my step sister in law who hails from China. She came out and made all kinds of wonderful food. Seriously, she spent hours and hours in the kitchen and between this and that I got to help here and there. I’m hoping to do a few posts on some of the wonders that she so effortlessly prepared. But back to the Bok Choy – we still had a package when she left, so I did just a simple saute one night. Just a little oil in the pan, then after the cut side was lightly colored, I added about two to three tablespoons of water, put on the lid and let it steam for a few minutes, until crisp/tender. It’s wonderful like that, and Bok Choy has such a beautiful, delicate flavor on its own, but I changed it up the next evening and tossed in a few additions. Add bok choy, stir around to coat with oil, then arrange cut side down, bulb end toward the center and cook about two minutes. Turn & add soy sauce and water, then cover pan and cook for approximately two minutes more, until steam begins to escape from beneath the lid of the pan. Remove to a warmed platter and drizzle with sesame oil & sprinkle with seeds. I’ll be bringing this to Fiesta Friday, hosted this week by Laura @ Feast Wisely. Make sure to visit Fiesta Friday this week – I’ve already seen several wonderful St. Patrick’s day recipes among the recipes and do visit Laura and her delightful blog. This entry was posted in Click here for Fabulous Food Posts and tagged Asian, Bok Choy, Frugal Hausfrau, Side, Vegetable Side. Bookmark the permalink. I will have to try this recipe. It looks good. I am seeing baby bok choy at my local grocers more often now. Though I can always find it at Jungle Jim’s. We had so many of them – I happily made a meal out of just bok choy, lol!! 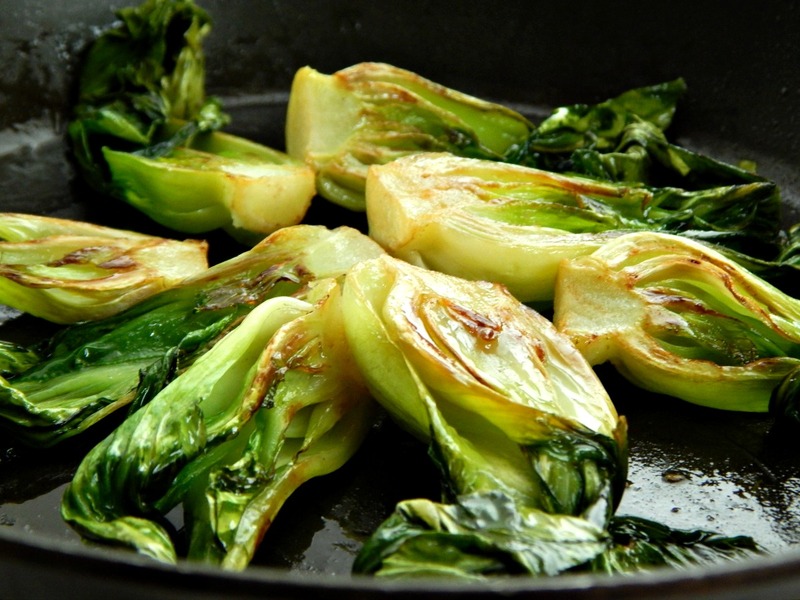 I think this simple preparation would bring out the best in bok choy. Thanks Liz – it was just beautiful. FINALLY! A reason to buy and cook bok choy. Yum! I love sesame! This sounds like a delicious combination. Hugs! Hi Teagan – I think sesame and bok choy are a perfect marriage! Well, thanks! I do love the flavor of bok choy! I wish they were more available here. A beautiful way to cook it. Luckily bok choy is plentiful and easy to come by in New Zealand so I shall be trying this for sure. It’s intersting how many people from so many places are chiming in with whether it’s available or not. Fun to see! I love bok choy. I think our grocery stores only have the baby version occasionally, but they are so cute! I wish we had a Chinese market nearby. I can’t wait to give this a try! Thanks Carlee. I will say that when it’s not always available, it makes it seem even more special! Gorgeous Frau. So simple yet so lovely. Thanks Marisa! I love it too. I can just eat it leftover, cold, out of the fridge and be perfectly happy. You had me at sesame oil! I can sometimes find baby bok choy at Walmart…fingers crossed! You’re sure welcome Carina, and I’m a kindred spirit! I just LOVE bok choy, but don’t cook with it too often. Luckily it’s in our regular grocery stores. I like to add it to soups. The hubs thinks I’m serving him wilted lettuce, usually. 😉 Glad you found some to enjoy!